Book cover: "The Dunwich Horror"
Here's the worn and awesome cover of H.P. 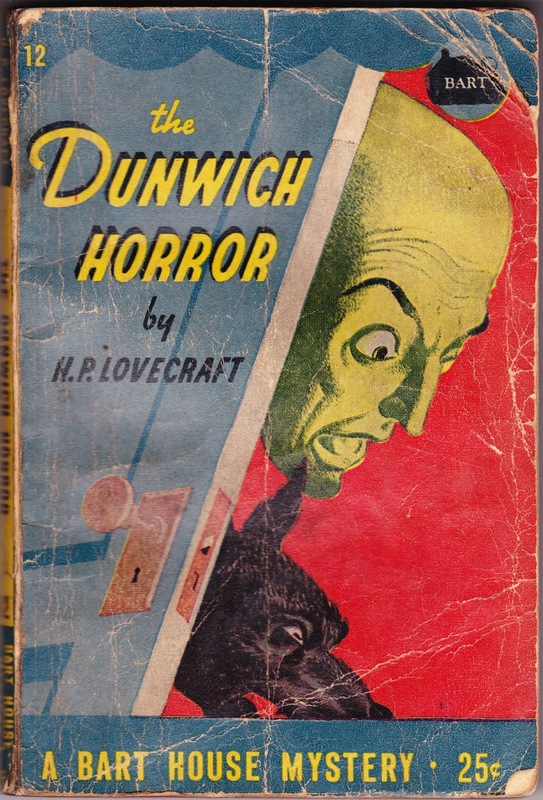 Lovecraft's The Dunwich Horror, published by Bartholomew House (Bart House Books) in 1945. The 186-page book contains three of Lovecraft's tales: "The Dunwich Horror," "The Shadow Out of Time," and "The Thing on the Doorstep." This post bookends nicely with The Weird Shadow Over Innsmouth, another Bart House title, which I wrote about in February 2016. 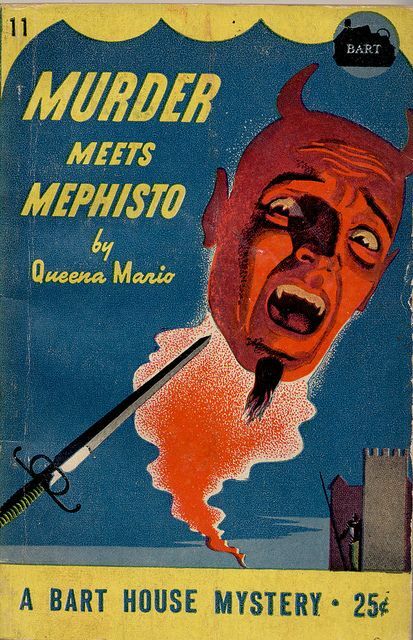 The back cover of The Dunwich Horror features an advertisement for Murder Meets Mephisto by Queena Mario. Bart House was only in business from 1944 to 1947, but it certainly knew how to create compelling book covers. An interesting, entertaining book is a bargain at any price. The problem faced by booklovers is that unusual books are hard to find at the right price. The editors of the BART HOUSE books and [sic] booklovers. They seek and select the unusual, the fascinating off-trail stories that attract continuous interest. Under the BART HOUSE imprint there appear fascinating novels and mysteries so appealingly individualized that one cannot tire of them. Mysteries, unique Detective Stories; haunting tales of the Supernatural; — escape from the everyday world through science-fiction and great romantic adventure reading. Variety is essential to reading pleasure. You always find it under the distintive imprint of Bartholomew House Books. For your great reading satisfaction — always ask for the popular BART HOUSE Books. "Looks a little like 'Leroy' doesn't it."